We’d love your help. Let us know what’s wrong with this preview of Dementia Reimagined by Tia Powell. The cultural and medical history of dementia and Alzheimer's disease by a leading psychiatrist and bioethicist who urges us to turn our focus from cure to care . 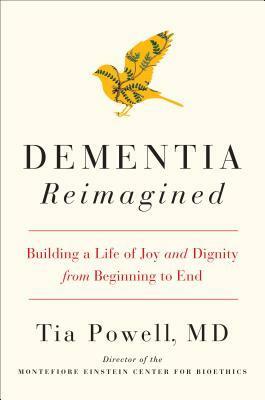 Despite being a physician and a bioethicist, Tia Powell wasn't prepared to address the challenges she faced when her grandmother, and then her mother, were diagnosed with dementia--not to mention confronti The cultural and medical history of dementia and Alzheimer's disease by a leading psychiatrist and bioethicist who urges us to turn our focus from cure to care . Despite being a physician and a bioethicist, Tia Powell wasn't prepared to address the challenges she faced when her grandmother, and then her mother, were diagnosed with dementia--not to mention confronting the hard truth that her own odds aren't great. In the U.S., 10,000 baby boomers turn 65 every day; by the time a person reaches 85, their chances of having dementia approach 50 percent. And the truth is, there is no cure, and none coming soon, despite the perpetual promises by pharmaceutical companies that they are just one more expensive study away from a pill. Dr. Powell's goal is to move the conversation away from an exclusive focus on cure to a genuine appreciation of care--what we can do for those who have dementia, and how to keep life meaningful and even joyful. To ask other readers questions about Dementia Reimagined, please sign up. Absolutely fantastic. The perfect blend of sarcasm, sass and wit that I'm looking for when talking about the state of aging and care for older adults in the United States. Dementia Reimagined covers the history of treatment of dementia in the United States and abroad in a way that I haven't come across in the many many books I've read on dementia. I love that she spoke about Dr Fuller, an African American research who came to a lot of the same conclusions about Alzheimer's that we are coming to Absolutely fantastic. The perfect blend of sarcasm, sass and wit that I'm looking for when talking about the state of aging and care for older adults in the United States. Dementia Reimagined covers the history of treatment of dementia in the United States and abroad in a way that I haven't come across in the many many books I've read on dementia. I love that she spoke about Dr Fuller, an African American research who came to a lot of the same conclusions about Alzheimer's that we are coming to now but was basically completely ignored in his time - probably due to racism. Dr. Powell tackles some of the difficult issues that those living with dementia and their families end up facing like is downsizing really a better option, but how can you age in place while also affording medical care while also doing what is best for the person while also acknowledging autonomy? And what happens when an older adult develops dementia and becomes violent? How do long term care facilities handle sexual relationships between older adults when one person has dementia (spoiler alert, they don't handle it well even when neither has dementia). Dementia Reimagined very quickly jumped to the top of my "favorite books on dementia" list. I've already recommended it to everyone I work with in aging and will continue to do so until they've all read it.